The ability to successfully forage for food occurs in different ways by different animals. Social insects learn to forage—that is, their behavior is modified based on past experience—while nonhuman primates learn by emulating their peers or elders. By contrast, this behavior is genetically influenced in the fruit fly (Drosophila melanogaster). COST-BENEFIT ANALYSIS IN NATURE. In 1966, Robert MacArthur and Eric Pianka, then at Princeton University, developed the optimal foraging theory, based on the familiar economic principle of cost-benefit analysis. Animals find food sources that provide them with maximum caloric benefit while requiring the least expenditure of energy. Foraging costs include “handling,” such as searching for the prey and then catching, eating, and digesting it. The ease of obtaining food must also be weighed against the risk of predators. The mule deer (Odocoileus hemionus), found in the Zion Canyon in southwestern Utah, forages for plants in open areas, although food is less plentiful than in forested areas and more energy must be expended to locate it. This animal prefers the open areas because it is less vulnerable to attack by mountain lions (Puma concolor), which can stalk their prey while remaining concealed in the woods. The optimal foraging theory describes optimal behavior, yet feeding in the wild does not always present ideal conditions, and the forager may be faced with a number of constraints and trade-offs. If the forager is too specialized or selective in its food choices, excessive energy will be expended in the search. Conversely, animals whose tastes are generalized or nondiscriminating will pursue unprofitable foods that may provide less benefit. The cost-benefit of foraging behavior is also influenced by the population of prey in a given geographic area. If the region has low prey density, the forager will spend most of its time searching for food and will eat almost any prey it encounters. But, where there is high prey density enabling new prey to be caught almost immediately, and the bulk of energy expenditures are devoted to catching, eating, and digesting, the forager can select food with the most favorable cost-benefit ratio. SEE ALSO: Metabolism (1614), Bioenergetics (1957), Energy Balance (1960). The benefits of an animal successfully foraging for food must be weighed against its costs—namely, exposing itself to predators. 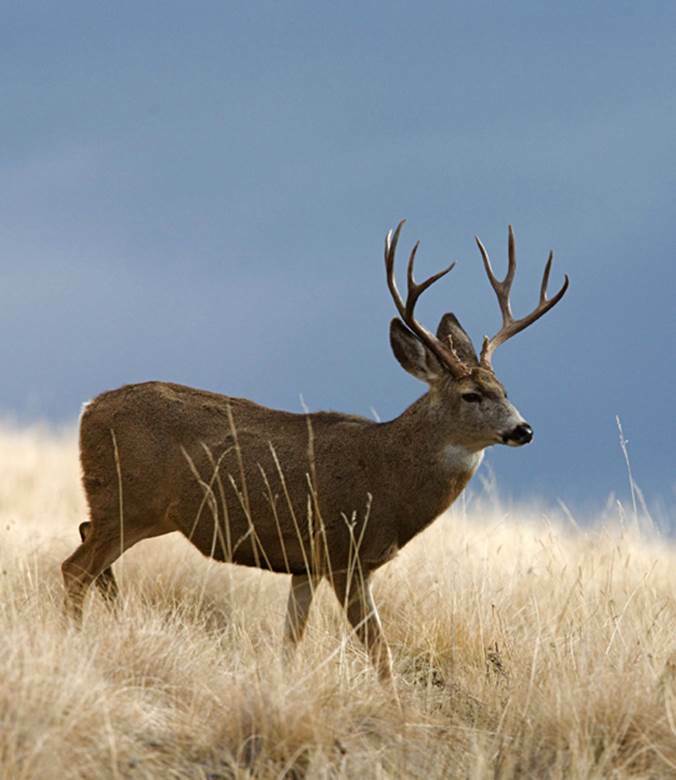 The mule deer (shown) forages for plants in open areas rather than in forested areas, where food is more plentiful. Feeding in the forest makes the deer more vulnerable to attack by mountain lions concealed in the woods.